Cheap baby shower invitations can be created with unique templates. Create homemade baby shower invitations so you can save money. To make cheap baby shower invitations, save coupons to use at your local craft store like Michaels Craft Store in the United States. I don't prefer paying full price for an item so I either use coupons or wait for sales. If you read most blogs, I think that's probably what everybody will agree with. Handmade baby shower invitations don't have to look "homemade". Craft punches help you create baby shower invitations that look professional. They also give it a polished look. You don't have to buy a lot of craft punches. Just choose one that isn't too busy and one that you can reuse for your other paper crafts. If you already have a card making or scrapbooking supplies box, then pick one from your inventory. And if you don't want to purchase a punch, then try using lace or border scissors as an option. For my homemade baby shower invitation I started with pink pattern paper that said "baby" all over it. Pick a cute baby print for a boy or a girl. Choose one of the colors from the print to use as the complimentary color. My baby shower invitation card has a dominant pink color so I used pink and white as the colors. 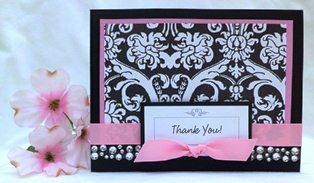 I used pink for the eyelet border and I used a border punch that had an eyelet design. This is the area where you can use lace if you choose not to buy a punch. For cheap baby shower invitations, try using a charm. I found this charm of a onesie at my local craft store in the baby shower section but you can probably find more charms online. Again, use a coupon. 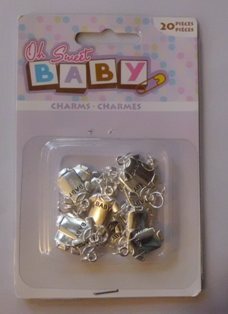 A package of charms usually have several in one package so you can make several invitations. This one that I purchased had 20 charms in the package. I bought the charms for about $2.50 using my coupon. Before you buy all the supplies for your baby shower invitation cards, mock one up so you know how much material you'll need. Once you get the final design that you want, measure all the items to make the card and then figure out how much of each piece you need to make the quantity you need. If you are buying individual sheets of pattern paper, depending on the size of your pattern paper, measure how many invitations you can make from one sheet so you know how many total sheets you need. Buy a few extra for mistakes and if you forget to invite someone. 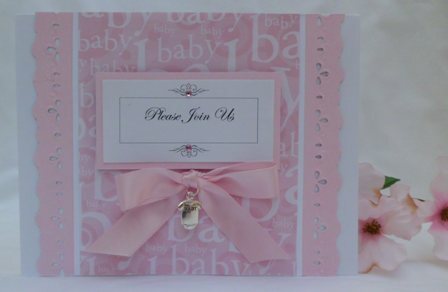 To make the assembly of your baby shower invites quicker, use precut and scored blank cards. Usually they come with envelopes so that will save you time so you don't have to make the envelopes and money, since you don't have to buy additional envelopes. Again, use a coupon or wait for a sale when buying your supplies. The card pack I purchased had 20 envelopes and blank cards in it. I buy a bunch of packs when they are on sale because I always have a need to blank cards. Buy a spool of ribbon for your baby shower invitation cards. If you use a coupon or wait for a sale, then it is more economical than buying it by the yard or purchasing prepackaged ribbon which can end up being more costly. Always compare the price per foot or yard when comparing costs. Look for double sided ribbon because when you make bows, you want to be able to see the satin finish on either side so you don't have to fudge around to make sure the satin side is facing forward. Another way to save money is making the sentiment yourself. I created my saying "Please Join Us" from my computer. Pick a cute or script font or experiment with all the fonts that are loaded onto your computer. Again, using my computer, I created a box around the sentiment words and added a little swirly design on the top and bottom of the box. I finishd the card with small gems just to give it a little "bling". To create cheap baby shower invitations, don't forget to look for sales and always use coupons to help stretch your dollar. Below is another card idea that was featured in my Sketch of the Month Club.